Which is healthier, olive oil or butter? Many of you may have heard that it is better to consume extra virgin olive oil (EVOO) than butter. But ... Exactly why? In this post, we will study the differences between both FAT and about the concrete benefits of EVOO vs. Butter. Currently there is no doubt on the fact that the quality of dietary fat is much more important than quantity and all the guidelines and recommendations advise a total fat margin of the diet between 20 and 35% of the daily energy. This concept is very important: The quality of fat has a profound influence on health. · Saturated fatty acids (SFA). They only have simple links. They exist only in foods of animal origin such as butter and in some oils of vegetable origin such as coconut or palm. They are the least healthy if they are ingested in excess. · Polyunsaturated fatty acids (AGP). They have two or more double bonds. They exist in seed oils such as sunflower, soy ... And in blue fish such as salmon, sardines, tuna. The consumption of it lowers the level of total cholesterol and bad cholesterol (LDL). · Monounsaturated fatty acids (AGM). They have a double bond. They exist in the EVOO and in some nuts. They contribute to our organism and improve the level of good cholesterol (HDL) and diminish the LDL. 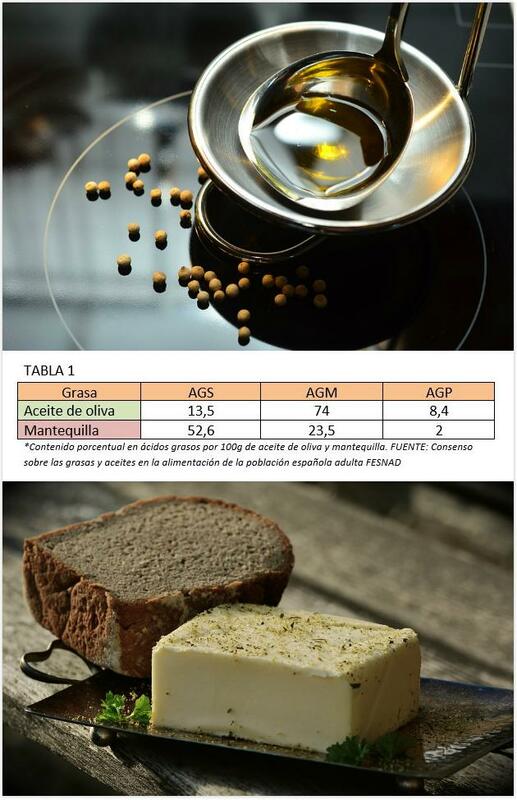 Knowing that the extra virgin olive oil contains mostly monounsaturated fatty acids and that the fatty acids in butter are mainly saturated (Table 1) , we can already guess which fat is better for our health. The WHO recomends us to replace AGS with AGP or AGM to improve the lipid profile since consuming less AGS like those of buttermilk and replacing them with AGM in olive oil reduces cardiovascular risk and could help slow down the 'epidemics' of obesity, the metabolic syndrome and Type II Diabetes Mellitus in developing countries. In this battle between extra virgin olive oil and butter, the winner is clearly the olive oil, but this does not end here! In the following posts we will face the oil again with other fats.